A Parmesan cheese of great excellence! Matured for 60 months! Strong taste but not too much, soft and pleasing to the palate it is an excellent high quality product that surprises for the delicate taste in spite of the long ageing. 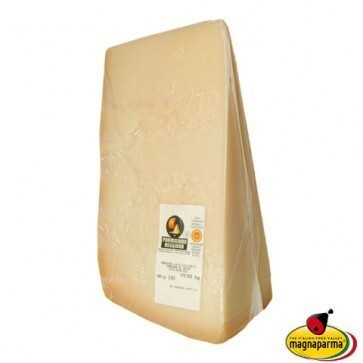 After 60 months the Parmigiano Reggiano is very aged, the taste is more strong and intense and the notes of spices turn out definitely predominant. A great variety of flavours is recognizable in this cheese. The rich spicy character, with a prominent citrus taste and herbs aroma, is characteristic of its fragrant flavour, tasty but never hot. The pale yellow colour derives from a long aging process, which leaves to this cheese a finely granular structure, with the typical breaking into flakes. 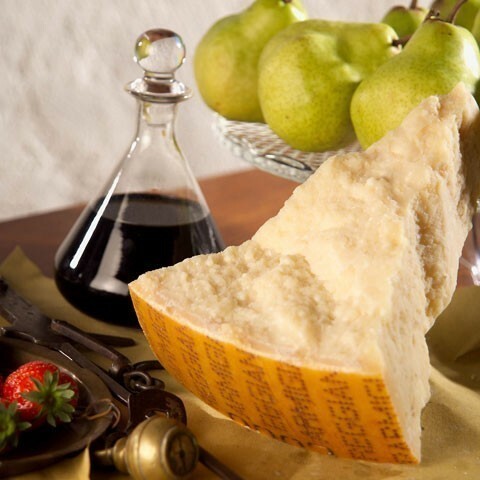 The milk and the flavours coming from the aging contribute to create a complex and elegant cheese, excellent when accompanied by the sweet notes of a watermelon mustard or by the soft acacia honey, and washed down with a good Pantelleria Passito. The combination of the strong taste of this cheese and the sweetness of the liquorous Passito makes this experience exciting. Excellent when accompanied by the sweet notes of a watermelon mustard or by the soft acacia honey, and washed down with a good Pantelleria Passito.